This is Part 1 of a two-part series about food in Wilmington, North Carolina. Sign-up for email updates to make sure you don't miss a thing! Every week, I compile a list of press releases that turns into a little piece called Road Trips. Published every Sunday in the Life section, there are anywhere between five and eight places/trips featured. I decided to take one of the road trips featured, and I found myself in Wilmington, North Carolina attending Flavor of the Past, an event sponsored by the Lower Cape Fear Historical Society. The catalyst for my trip was Foodbuzz. 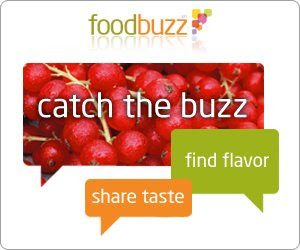 I contacted Foodbuzz about their Foodie Correspondent Program, I got the green light and an opportunity to get a press pass. Volunteers dressed in period clothing and portrayed men, women, and children living during the boom times of Wilmington. Everyone did an excellent job, staying in character, and maintaining the preservation of times of long ago. Flavor of the Past, was a day full of food and history. This year marked the sixth-annual Flavor of the Past. This year’s theme, Boom Times in a Boom Town, focused on Wilmington’s eras of prosperity, from the 1800s through World War II. I'm not sure what years past entailed, but this was an eye-opening, fun and food-filled experience. We ate all day long. And when I say "all day long," I mean All. Day. Long. First, was the opening ceremony and greeting at Thalian Hall, a center for the performing arts. 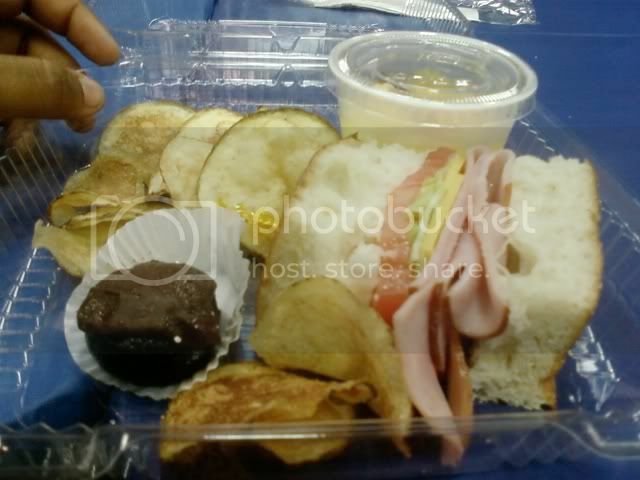 I have to admit, I was late and did not see most of the presentation, but I did get the food! Angie's of Chris' Restaurant provided mini Southern style chicken biscuits, milk gravy, grits, sliced fruit, and sweet tea. As a matter of fact, when I walked into the theater, I was plied with a cup of sweet tea. Southern hospitality at its finest! The biscuit was a little dry, and the chicken was OK. 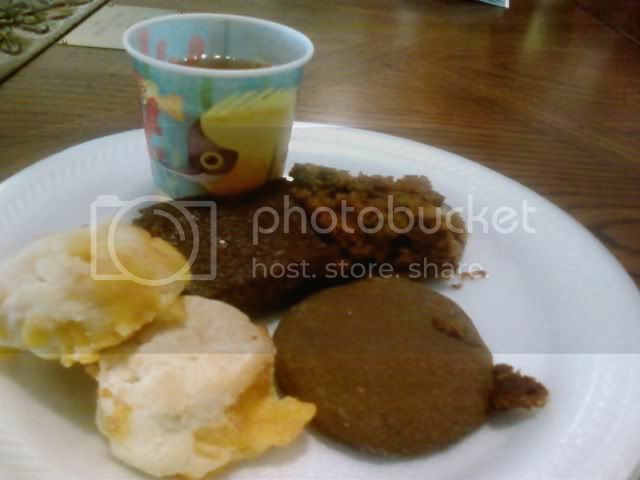 It was apparent that a chicken patty has been fried and cut into small pieces before being placed on the biscuit. I hate to say it, but McDonald's does a better job. The gravy was the best part. It was just plain ol' milk gravy (no sausage) and it was excellent. It had the right spice, saltiness, and I just wanted to put my face in the tureen! 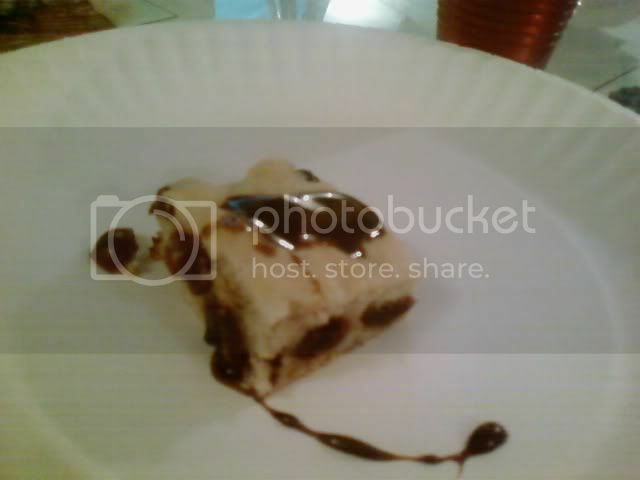 Unfortunately, white gravy on a white Styrofoam plate looks horrid, no matter how much you tone the picture. But just know that it was good! after taking so much time to make the good gravy. Although each location was accessible by walking, trolleys were available to take you to each site. 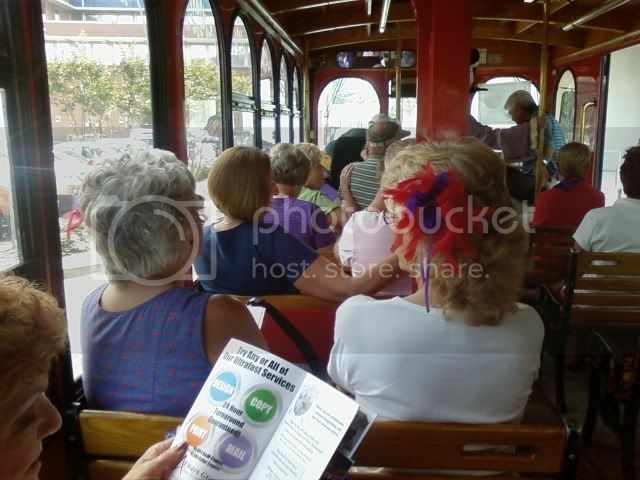 I took the trolley and I was fortunate enough to meet a wonderful, sassy group of ladies from the Red Hat Society from Southport, NC. These ladies were my traveling companions during the whole tour. I'm lucky to have met them. I became their "official" photographer and I do believe we all became fast friends. I hope we meet in the near future. Next, was a stop at the William J. Price House. Inside, we "met" boom-time architects Rufus Bunnell and William J. Price. After a mini-presentation, we got to sample some fare from Sticky Fingers, a local BBQ & rib joint. Don't you like how bbq places are called joints? Not place, restaurant, or eatery. But joint. 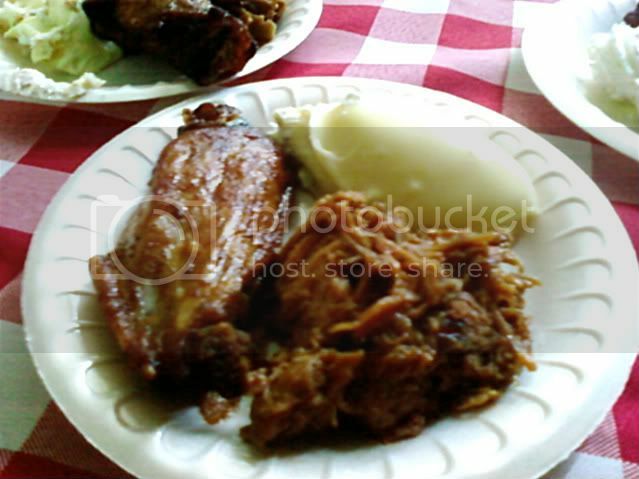 Clockwise: Hickory smoked chicken wing, banana pudding, slow-smoked pulled pork barbeque. The chicken wing was the best thing on the plate! I went back to get one more. Yes, I was a bit greedy. But I told myself I was doing it for research. The banana pudding may look OK on the plate, but I decided not to eat it. I was told that it didn't taste very good, and I'm glad I saved my palate from that disappointment. "Lemonade" and fresh brewed tea were also available. I chose the lemonade, or at least I thought I did. It tasted more like lemon-scented water than anything else. My girls, chowing down on the 'cue. Instead of wearing the signature red hats on this outing, someone was ingenious enough to make red and purple feathered plumes. Hey, ladies, can I have a pink one?? Hmm?? Next was the Bellamy Mansion, which now houses the Museum of History and Design Arts. This home was by far the most grandiose and well-preserved. The heart of any home, the kitchen, was the best part. We "met" Mr. & Mrs. Bellamy, cousins, a son, and Sarah, the Bellamy family's enslaved cook. 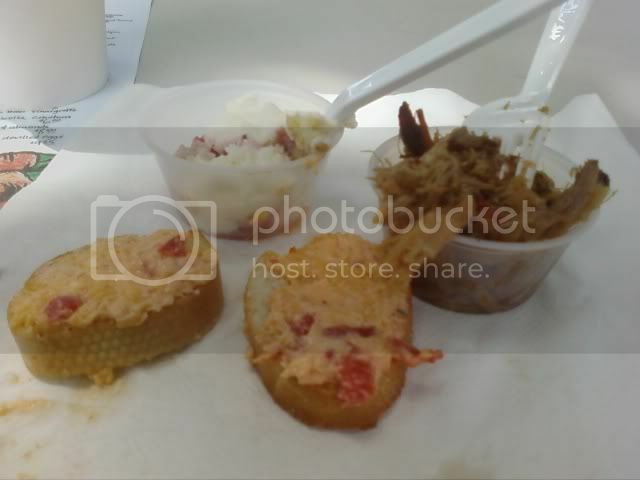 From local eatery, The Basics, we dined on traditional Southern pimiento cheese on bread rounds, Georgia-style pulled pork barbeque, strawberry shortcake (Sarah's specialty), and you guessed it, more iced tea. Let it be known that in the South, when you asked for iced tea you'll be asked "Sweetened or unsweetened?" In some locales, you don't get a choice. Sorry Mr. & Mrs. Diabetic. Hopefully you brought some Splenda with you in your purse. Not the most aesthetically pleasing conglomeration of food, it was delicious, nonetheless. When I asked why the pork was Georgia-style, I was told that the sauce was made with peaches and the gentleman who actually made the pork was from Georgia, too. How fitting. Next was the Hannah Block USO. I had no idea USOs were still in use or viable in today's world. Now a community center, we got to kick back and relax on plush couches, breathe in the crisp air-con, or go to the auditorium and watch newsreels and cartoons. It was a nice respite to just hang out here. A replication of a sign posted in the canteen at the USO. The only reason I took this photo is because I thought it said Crown Royal and got excited. 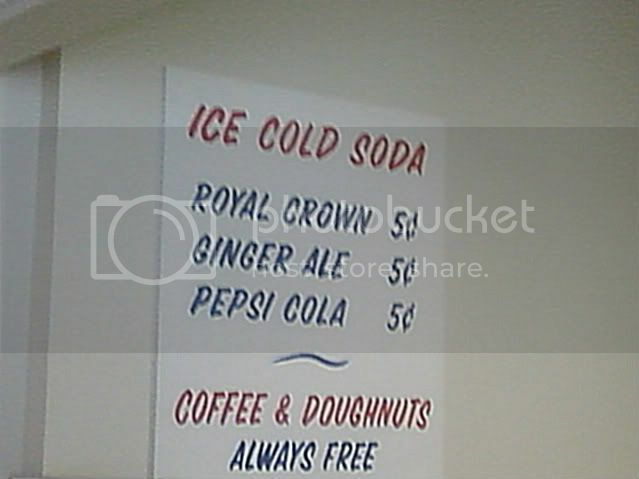 Better known as RC Cola, many Royal Crown drinkers like to take salted peanuts and put them in the bottle. After finishing the cola, the peanuts are eaten. The same can be done with Dr. Pepper, too. Sweet & Savory Bake Shop provided our afternoon snack. The raisin cake was the absolute best thing on the plate. It was moist, sweet, and delicious. And I don't even like raisins (shhh...please don't tell my mom. She'll want to know what happened to all of those boxes she gave me for snack in kindergarten...). The gingersnap tasted more of "snap, oh no she di'nt" than anything else. It was horrible. Too tough and too much baking powder. As was the cranberry tea. They forgot to put sugar in it. Or something. I'm not sure.... but the raisin cake's goodness made up for the shortcomings of everything else. 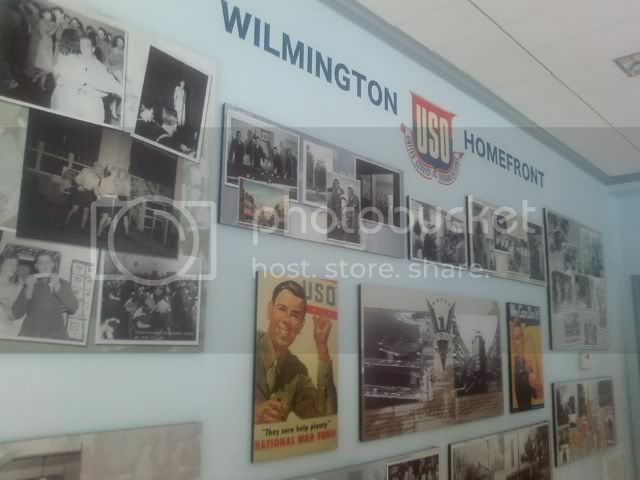 By the time I left the USO, it was nearly 1:30 in the afternoon. I was beat, I was tired. I didn't want to go on! But the lure of fresh brewed sweet tea kept me going! 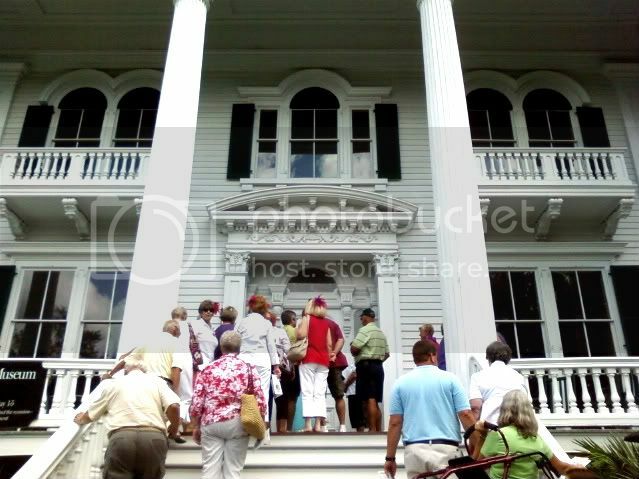 The Latimer House Museum, home of the Lower Cape Fear Historical Society, let us see an upper-class family at home during their leisure time. 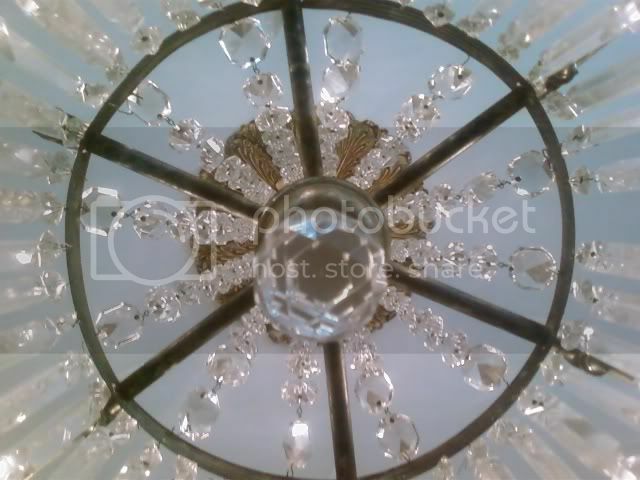 Underneath a crystal chandelier in a parlor room. Fat Tony's Italian Pub provided the second installment of our afternoon snack. Unfortunately, due to my allergies, I did not partake in much of the fare offered: Carolina Ham, cranberry cherry scones with molasses, Victorian lace cookies, and what else? Sweet tea. I think it's funny that an Italian restaurant provided such dainty food. Cute. Kind of. I did have a few cubes of the ham offered. It was dry and tasteless. I'm sure after sitting in a hot box for a few hours, you'd be dry and tasteless, too. Cranberry cherry scone with molasses. Moist, flavorful, and easy to make. Combine the butter and sugar and beat until butter is soft. Add kosher salt and egg yolks until evenly distributed. Add milk, pastry flour, and baking powder and mix until even. Using a rubber spatula, gently fold in cranberries and cherries. Take one pound at a time, and make a circle 1/2 inch thick on a greased cookie sheet. Cutting almost all the way through, divide into eight wedges. Bake at 425 degrees F for 18 minutes. The last, most interactive spot was the Cape Fear Museum. There was so much to see and do, that I went back the next day just to enjoy the museum. Here, we were given tokens in the makeshift Red Cross tent. I met a "nurse" whose real name was Pepper and had a real-life big sister named Tammy. Our final destination (and best by far) food was from The Pilot House. Everyone in the group said they wish we'd come here first. Smoked ham and cheese sandwich, homemade potato chips, a "sweet victory" donut hole, fresh fruit salad, and zesty lemonade. Mix cookies and cream cheese in a mixing bowl. Roll mixture into small balls then dip in melted almond bark. Set on tray to cool. Come back on Wednesday for the next installment of Flavor of the Past. Think you might miss out on the fun? Sign up for an email update and you can learn all about the heart of Wilmington: its kitchens. Ahh - so much food - I'd be right in heaven! D: it was like itty bitty teeny tiny samples of everything. If you'd wanted to chow down, you'd have to wait until you got home and fixed yourself something to eat. But I was full by the time we got to the museum. I mean, I started eating at 10:30 AM and didn't stop til 3:30. THEN, my friends had me over for dinner. I'm surprised I can still walk around. All that food looked great. I love doing stuff like that. I have to tell you I love your new profile picture. You look good in thoese colors like the video.Its the makeup artist in me! Nik, your descriptions never stop me from laughing... ever :) Everything from "lemon scented water" to comparing food to McD's... and helping me out by telling me I shouldn't order "Iced Tea". Simply hilarious. I love sampling and eating bombardment... as long as I can walk around. I'm glad you paced yourself, because that was a food onslaught. Courtney: Thank you, my friend. I never really wore make-up as a teenager and I'm just coming into it now. Just like my food, I guess. Pinks and oranges are the colors that look good on me. What "season" does that make me? Adam: Thanks, dude! Ha! It was really a fun fun time! The food was the main event in my mind, but the historical stuff really added to the day. And yes...this was the beach vacation LOL. Gosh, you've been busy. There's so much to comment on. This branch gets a little snippy when they go out to eat. Maybe they call them joints because there are a lot of animal bones everywhere? My mom joined a Red Hat group last year and we went one one outing and it was SO not fun (to me). That particular group was mean and catty. We saw some of the ladies at a social function, and it was like they didn't know US! It was the scandal of the year! Or at least the week. You are so friggin' smart! I never thought about the animal bones. Ha! "...mini Southern style chicken biscuits, milk gravy, grits, sliced fruit, and sweet tea..." You just described my wet dreams. But dry, evidently? Needs more gravy. Vicci: The lemon water wasn't that bad, it was refreshing. But don't you hate thinking you're getting one thing and then ending up with another?? Heather: who is that in your photo? And what have they done with my friend? Your wet dreams are my reality. How fun LOL And gravy wouldn't have helped that biscuit. At all. Just having too much fun while the rest of us WORK!!! !